One of the most important Korean architects practicing today, H-Sang Seung worked for Kim Swoo Geun (a significant contributor to modern Korean architecture) before founding his own office, IROJE architects & planners, in 1989. He was a core member of 4.3 Group, which helped to shape 20 years of Korean architecture since Kim Swoo Geun; and participated in founding the Seoul School of Architecture. Seung’s leading work is informed by his philosophy on emptiness, the subject of a book he co-authored with Min Hyun-Sik in 2005. 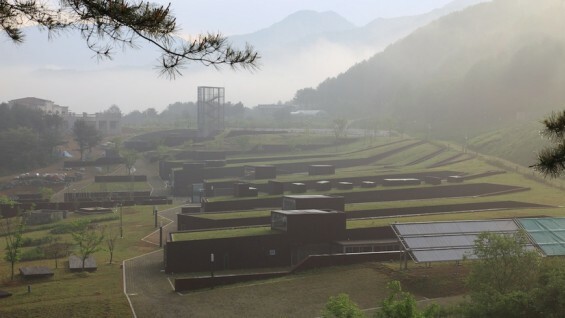 According to Seung, “empty space is unique in that it offers extraordinary experiences in the context of ordinary…it mobilizes [the] senses and provides room for sound, weather, seasons, nature to take place within [us]. His built work demonstrates keen interest in formal variations, boundaries and the creation of dynamic urban-like environments. Seung has gained international recognition for projects such as Welcomm City in Seoul (2000); Commune by the Great Wall in Beijing (2001); Chao-Wei SOHO project in Beijing (2004); Korea DMZ Peace-Life Valley in InJe (2005); Guggenheim Pavilion in Abu Dhabi (2007); the grave of the late former President of Korea Roh Moo-hyun in Kimhae (2009). Seung was an Honorary Fellow of The American Institute of Architects in 2002 and the Korean National Museum of Contemporary of Art named him 'artist of year’ in 2002, the first architect to receive the honor. Seung maintains an active life outside of his firm’s office, teaching and publishing several award-winning books: Beauty of Poverty (1996, Mikunsa), Architecture, Signs of Thoughts (2004, Dolbegae), and Landscript (2009, Yoelhwadang). With Chinese artist and architect Ai Weiwei, Seung co-directed the 2011 Gwangju Design Biennale—producing a markedly more politically provocative and participatory exhibition than the South Korean biennale has known in past years.